Things does not always go the way you hope and wish for, that is something you learn over and over as an athlete. It also teaches you to really appreciate the times when everything goes your way. 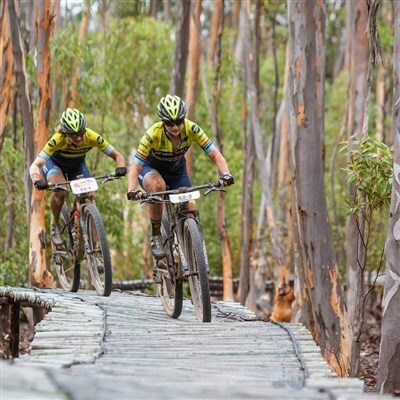 I had high hopes for the Cape Epic 2019 but it turned out to be a week I want to forget. There was very tough competition in the ladies field this year. At the same time, there were not so many teams, it was as if only the top teams entered , I hope there will be more teams coming to this event next year. 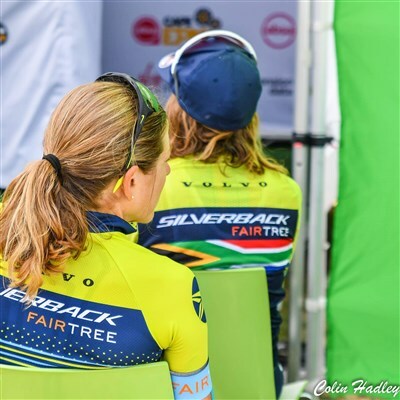 There was of course the team ofInvestec Songo with Annika Langvad (current XCM world champ) and Anna Van der Breggen (current road world champ) who stood out as the favourites this year. But there were probably 5 teams who could be there to challenge. 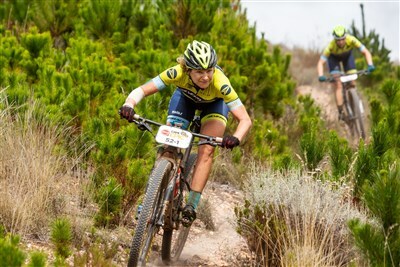 Ariane Lüthi (who has won the Cape Epic 3 times) teamed up with Maja W from Poland for Team Kross-Spur, Maja was 3rd at the World XCM champs last year and one of the best mountainbikers in the world. 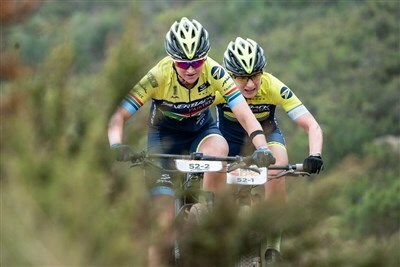 Candice Lill and Adelheid Morath who won W2W together teamed up again for Team Summit fin. 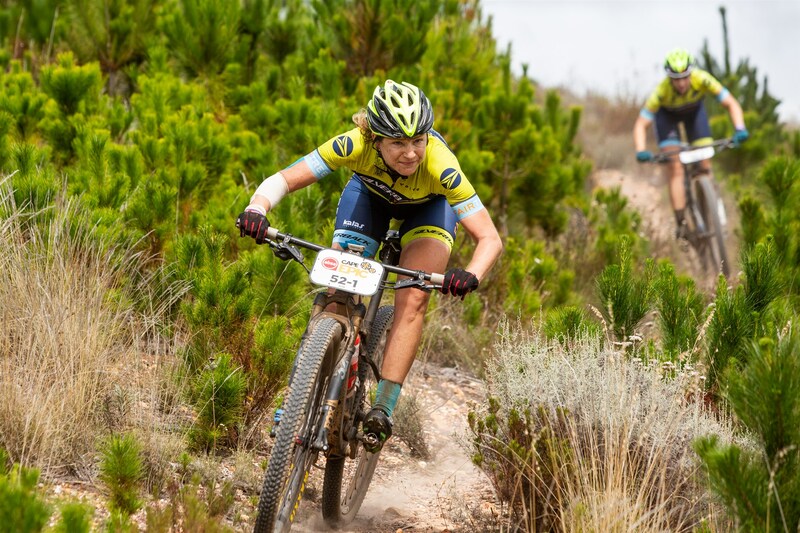 Sabine Spitz was back at the Cape Epic with her German partner Nadine Reider, riding for Meerendal. 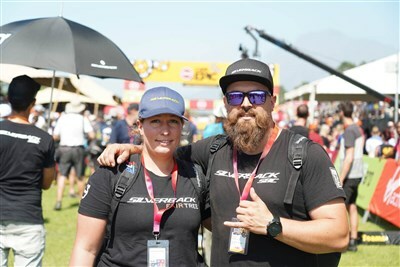 We also had the 2 South African teams of Sam Sanders and Amy Mc Dougle for Dormakaba and Sarah Hill and Theresa Ralph for Gallileo Risk, both strong teams who could mix it up at the front. 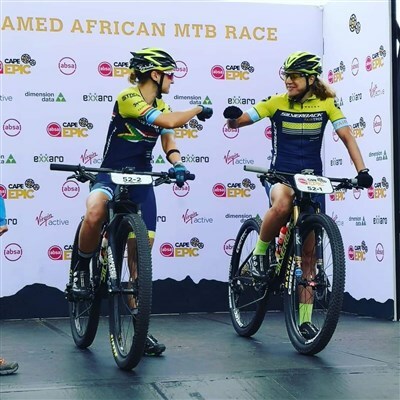 It would be a tough week for us but we were motivated and with our win at the Tankwa Trek we felt confident to do something good at Cape Epic. 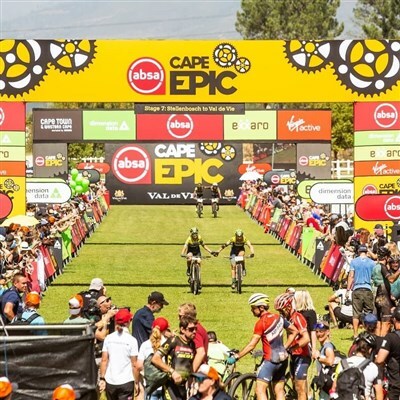 Finally the day came when we were going to start Cape Epic 2019, I had been waiting long for this day, it was 2 years since I last did Cape Epic and it is one of my highlights for the year. Even though, I had a strange feeling before the start. It had been a difficult time leading up to the event with behind the scene stuff with planning and organization around the team, and at the same time as I was nervous, but a different kind of nervousness. 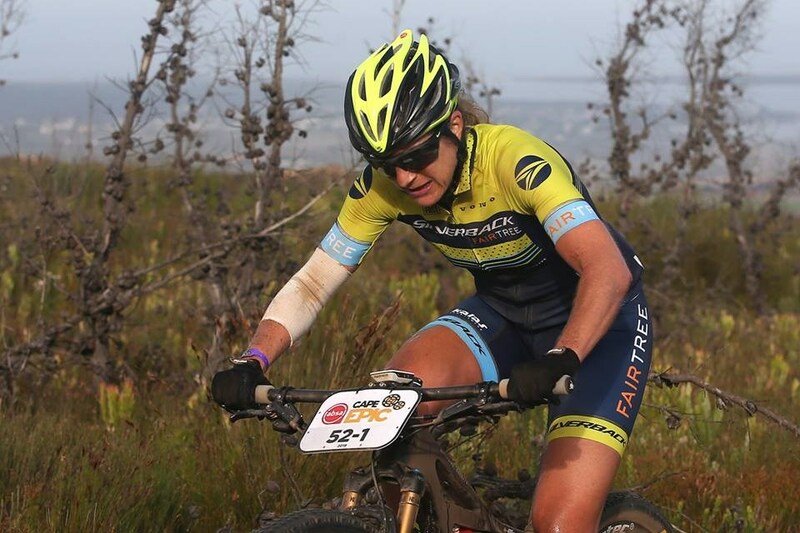 I was not sure where I stood since I had not felt on top of things at previous races, but I normally peak for Cape Epic so my faith was on that I would feel good during the week. I met up with Mariske at UCT in Cape Town and we warmed up on the rollers under a roof as there was light rain in the air. Our start was at 11.14. It is always awesome to stand there on the start ramp with all the cameras aimed at you and see all the spectators and almost hear how the heart beats the last minute before the start! 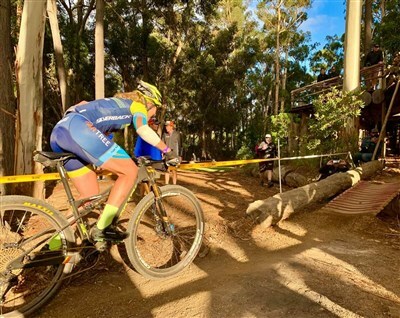 We got a good start and I felt strong up the first hill and pulled a lot on the tar and gravel roads and let Mariske go first on the short single track in the beginning. Mariske struggled to get her legs going so we took it a bit easier, we had a long week ahead of us! She was still strong on the steepest parts and up on the flat tar section I needed to recover and she took the lead. When we rode down the technical section of Plumpudding I heard that we have cyclists behind us and I was very surprised when it was Anna and Annika who were behind us, they started 4 minutes after us! I realized we were riding slower than I thought. We managed to keep the same pace as them to the finish and got a 5th place. Not what I was hoping for but we were "only" 1.26 behind second place. After the dope test we were off to Hermanus where we would stay for 2 nights. I was excited to get the real race started! The stage started with the climb up the Rotary drive in Hermanus and it was a bunch sitting together up there feeling each other out a bit. It was fast on a downhill on the other side and unfortunately I was a bit too far back in the bunch as we turned in on a short single track piece. Anna and Annika attacked just after and Mariske went with them, I had to pass all the other girls before I could get to Mariske and by then the 2 up front were already gone. I am sure we could have gone with them at least for a short while. Cross and Summit came with us and we rode with the 2 teams for a long time. Ariane looked tired on the climbs and I thought they would be the ones to drop first but eventually they got away from the rest of us and we worked together to try and close the gap. After about 75 km we came to a steep hill, "Charlie's climb" and I thought Mariske looked strong I was a few meters behind her when she said “Jen, you set the pace” I thought it was because I was slower but then she said “I am done” and it was as if someone switched off the light bulb, she was completely exhausted. All I could do was to nurse her home and make sure we were moving forward the whole time. 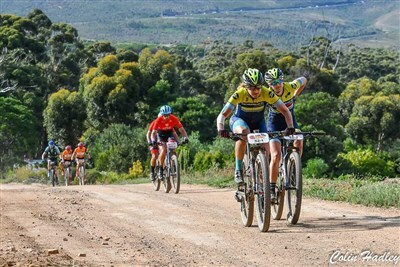 I almost thought that our Cape Epic was over and I would ride in an outcast jersey the following day. Little did I know…. When we got closer to the "Land rover technical terrain" I thought it was better if Mariske sits in front since she is faster on the technical stuff. I sat behind and lost concentration for a split second and suddenly I hit the ground hard on a loose gravel corner, my front wheel must have just slipped. I got up quickly and nothing seemed to be broken on my or on the bike, but a lot of blood came from my right elbow and I had a big hole in my bibs on my right hip. We carried on and at the bottom of the technical section Mariske suddenly makes a somersault, she hit a ditch which was impossible to see. This is almost too much for us and all we wanted to do is to reach the finish. We eventually crossed the line in 4th place. We lost 8 minutes to Summit after they left us 35km from the finish… Not a good day! But little did I know that it was only going to get worse. I showered and went to the race doctors who needed to give me local anaesthetics to be able to clean my wounds properly and I also needed 2 stitches, it hurt but what was worse was my hip which was sticking out 5 cm, it was a very bad heamatoma. We did what we could to recover, Mariske ate like a horse and I got strapped up by Nicole. I was a bit sore when we were warming up, but it was not too bad and all the strapping helped a lot to protect it from shaking too much. I can’t say that it held me back much physically but I don’t think I was mentally prepared to race hard after Mariske had been so tired the day before, this day she was very eager to go hard. The stage started the same way as the day before but without attacks and the group stayed together much longer. This day it was my turn to switch the lights off but it happened much earlier. On one of the early climbs I could hardly stay in the bunch and I was very thankful for the long stretch of gravel and tar road we had before we hit the sandy single tracks. This is where it all split up and the first 3 teams left us and we never saw them again for the rest of the day. We even lost Sabine and Nadine, I just could not keep up. After a while we could see them again and caught up but could not pass on the open gravel roads so we ended up riding together with Meerendal for a long stretch. We wanted to attack, it was good for my head to switch in to race mode again and I managed to go with her. We were away for a bit but eventually they caught us again on the long climb up to Houw Hoek and once again we were riding together. 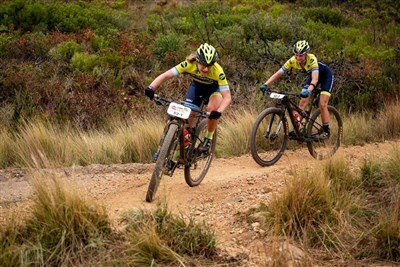 Eventually with only 3km to go we managed to time another attack well and got away, it was nice to push hard on the trails we knew so well and at least get another 4th place on the day. Today it was my turn to try and eat like a horse to recover, that was after I had been to the race doctor to get my wounds taken care of and stitches checked so there were no infection starting. 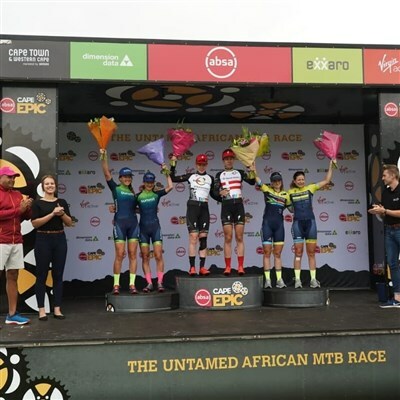 Even if we were going up to the highest point of the entire Cape Epic, and do the massive climb up Groenlandberg, this day did still not earn the rights to be named the Queen stage. 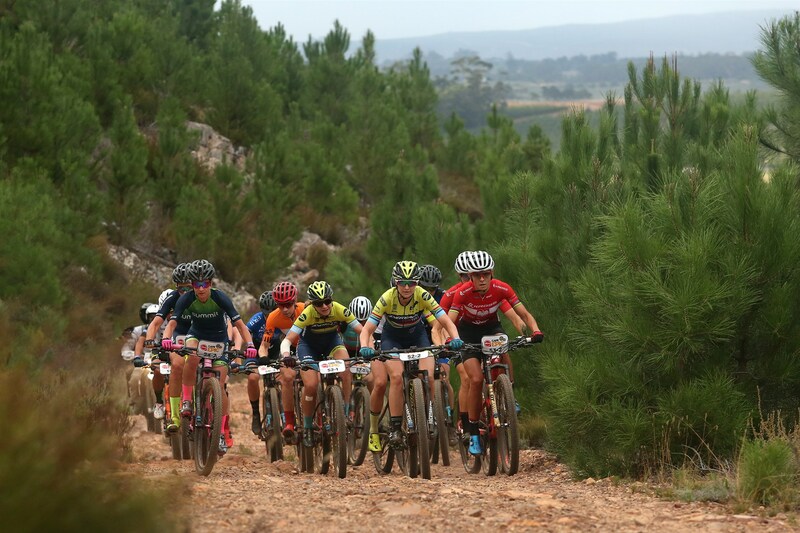 It would be a long and tough day on the bike and we enjoyed the first 5 km being neutral through Grabouw. My legs felt a little bit better and I could even sit at the front a bit when we climbed up Neuweberg to the hot spot which was already after 12 km. But when Annika and Anna attacked 1 km from the top I had nothing to respond with, I could only keep one pace. Summit and Kross also went ahead but shortly after we passed Kross when they were busy fixing a puncture, we could also see Candice and Adel not too far ahead as we started the climb up Groenlandberg. We kept a steady pace up and rode carefully down on the other side, we did not want punctures. It was rainy and foggy up on the mountain and it made it a bit sketchy and slippery. Ariane and Maja caught us before the second section of the Groenlandberg and we did that climb together with them. I could not keep their speed on the downhill and took it a bit more carefully, but soon we passed them fixing another puncture. I still felt ok as we passed the water point at 64 km and even if I was tired I felt that I could push hard. That feeling disappeared at around 90 km and it turned out to be a very long way home. I had nothing left in me but luckily Mariske felt strong and could help and motivate me and we managed to stay in 3rd to get our first podium position for the week. 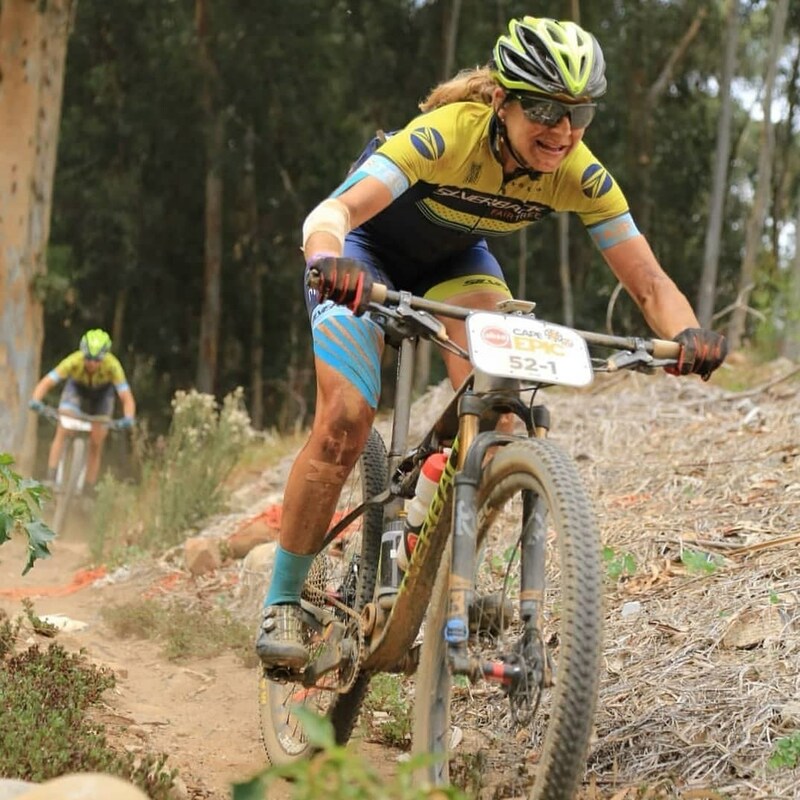 It felt so nice to step up on that Cape Epic podium again, even if it was the lowest step. It was nice to get a bit of a sleep in with our start being 07.47, also to know that there would be a bit more time for rest and recovery after the race. It was the first time I did a time trial in the Cape Epic. 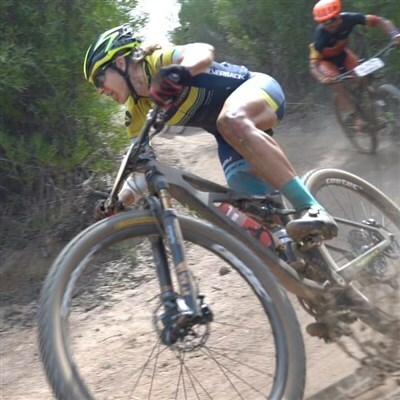 It felt good at first but soon it was clear that Mariske was stronger than I and since she is also better at the technical sections it was natural that she would sit in the front most of the way. Even if she was waiting for me it felt like we had a good pace and were riding well. After about half way we started passing the other teams and eventually we passed Sabine and Nadine who started 3 minutes in front of us and we were now the first ladies’ team to reach the finish. Since the e-bike came behind us on the last single track I thought we might be in for a podium spot, the TV production normally does not care about the teams outside of top 3. But all 3 teams who started behind us were faster and we ended up 4th again, only 39 seconds from 3rd. It was a bit disappointing. It was very nice to have an afternoon to rest and get a longer massage, we even had time for a soft served ice cream at the Perigrine farm stall! Unfortunately, my throat started to be sore that evening and I struggled to sleep that night. This day, the legs felt better in the beginning after yesterday's short stage, at the same time my throat was sore and it was difficult to swallow…. Fortunately, everyone started to get tired so the speed was not so high from the beginning. Mariske sat for a long time at the front and I behind, which gave us a good position when we came to "the cement strips", it is so steep the cement is needed to get traction. At the top, however, Anna, Annika, Candice and Adel had gotten a gap and I could not follow. Kross had already dropped and was behind us and we rode for a bit with Sabine and Nadine. After a while we felt that we didn't want to drag them so we attacked and got away, we could see the 4 in front for a long time until we were at the A-Z single tracks. We climbed up to the "portage section" the 2 km where it was compulsory to walk down. It was tricky to walk down over the big rocks with a bike and in cycling shoes, but we managed. We passed Anna and Annika shortly after the portage, they were fixing a puncture and we were now lying in 2nd and it also meant that we could not have been so far behind them. At about the 50 km mark Anna and Annika caught up with us and we managed to sit with them for a while, it was fast and I really had to dig deep to stay on their wheels, eventually I had to let them go, I just did not have their speed in my legs. 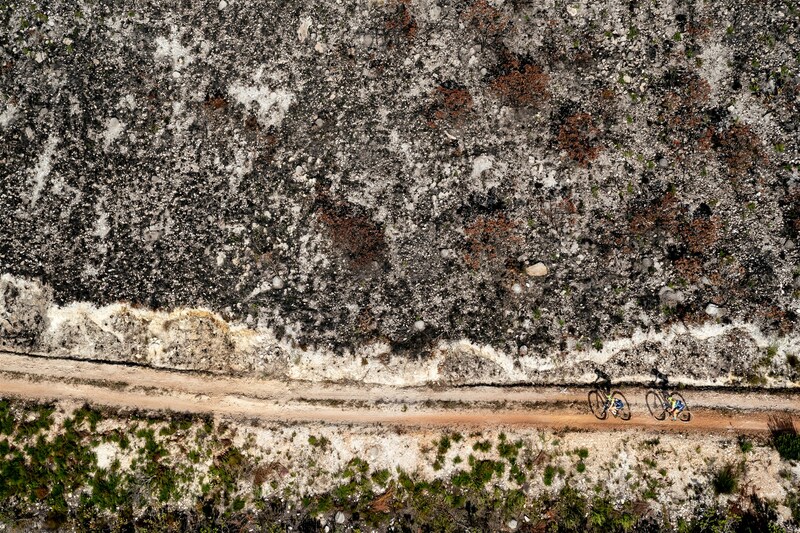 The climb up Helderberg was long and hard, there was a reason why this was the Queen stage of this year’s Cape Epic. I was completely exhausted when we were at the top and it was a relief to get to ride the long downhill to the bottom of Helderberg! At the bottom we passed a water point, we had just gotten the information that we were 8 minutes ahead of Kross, which meant we were making up time on GC. The last 20 km to the finish felt very long, I really wanted to push hard to keep our 3rd spot at the same time as I was so tired I could hardly pedal. 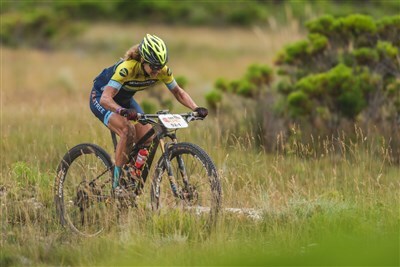 The closer we came to Stellenbosch the more people were out and I heard my name all the time, it was fantastic to race so close to home. 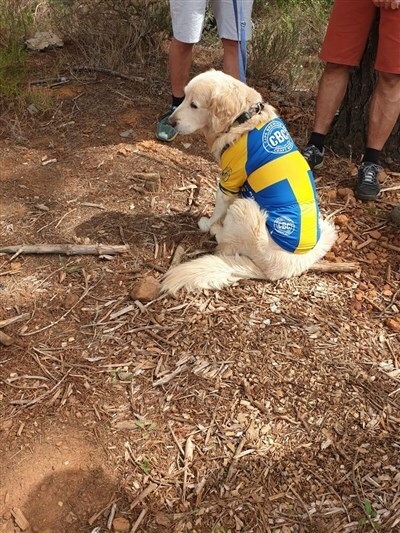 My motivation was also that I knew Pino (our neighbours’ dog) would be somewhere in Eden forest and I laughed when I saw Hendrik with Pino dressed in one of my cycling jerseys with the Swedish flag, he was so cute and it gave me energy for the last few kilometres. With just a few kilometres left, Mariske crashed, I didn't see what happened but came to her when she was on the ground, later I was told that she tried to overtake another cyclist on a single track and they both crashed. Luckily everything went well! 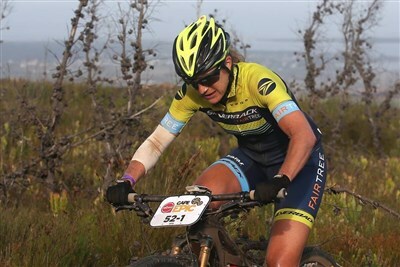 It was awesome to get up on the podium again and specially to do it in Stellenbosch! We had taken 10.5 minutes on Kross and now only had 8 minutes up to 3rd on GC. However, I was a bit worried about my throat which had now turned in to a head cold. By now I had a full on cold, my throat was sore and I had a headache. 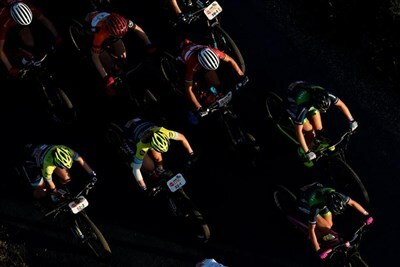 I did not know what to do, I did not want to stop but I also know that it is not good to race with a cold, and I have already done one heart operation and do not want to do long term damage. It was also not a good combination to have a cold with a really tough stage ahead, which started with a mountain pass to get over. I have never experienced this feeling in my legs, it was like there was air in them, completely empty from muscles. 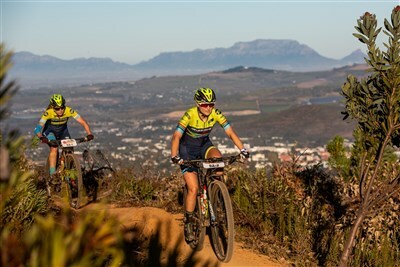 As soon as we left the tar and started the climb (this after 1-2 km) Annika and Anna attacked and Summit went with them, I could not stay on the wheels of either Kross or Meerendal and Mariske had to help me just to move forward. I knew I was disappointing her since she really wanted to close more time on Kross on the GC. The first 8 kilometres were just pure pain and with lots of friends standing along the route all I wanted to do was to stop by them and close my eyes. We finally reached the top to enjoy the downhill and the “Skyfall” trail, one of the most amazing single tracks in this area and one that I have ridden so many times. Even though I knew every corner I felt insecure going down, I struggled to focus on the trail and control the bike, and my head felt too big to fit in the helmet. This of course did not help and it became a very long day, mentally I think my longest and toughest day on a bike (that I can remember anyway). The slopes were so steep that I barely made it up. Everywhere we rode were places I knew and yet I couldn't really enjoy it since I didn't have the slightest bit of energy in my body. We were so far behind today that all chances of advancing upwards in GC were gone and we were suddenly in the danger zone of losing our safe 4th place, we now only had 8 minutes down to 5th. 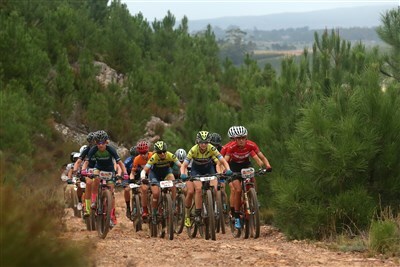 I did what I could to try to recover in the afternoon, but it was not easy after 7 days of racing and with a cold. If yesterday was my hardest day on a bike, this was probably number 2… at least it felt that way. All I wanted was to cross that finish line in Val de Vie. 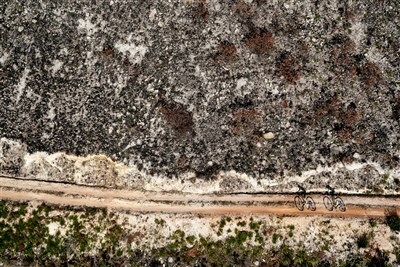 We rode the tar road to Jonkershoek to ride the trails I can do in my sleep, I have ridden them so many times. As we entered the nature reserve and started to climb my legs were empty again. We lost the front immediately but still managed to keep the distance so that we could see Nadine and Sabine which was the most important today. I pushed everything I had, at the same time as I had thoughts in my head, on how well I know that you do not cycle with a cold. A friend was along the route and told us that we were 40 seconds behind Sabine and Nadine and a bit later it was 1 minute, at least we had 8 minutes to spare. After Jonkershoek and through Botmanskop I felt a bit better and I could start the countdown. The stage was “only” 70 km and the last climb was after 55 km and from there it was downhill or flat, so I had the 55 km mark in my head. 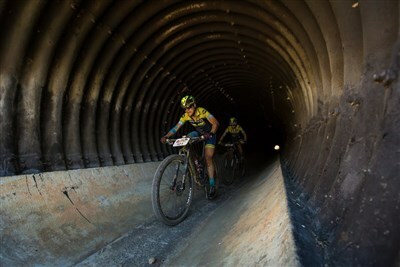 We rode a bit on yesterday’s stage but backwards, this meant that we would go through the tunnel under the Hellshoegte road but from the other direction. I've done that tunnel many times up, something I don't like but it's still okay because it goes up, but I have never done it downhill. I went in first and when it is so long and it is completely pitch dark, you see only a small dot at the far end which is the opening on the other side, so you lose perception of ​speed. I only freewheeled but I guess it was still pretty fast. The tunnel is a round pipe and I must have come up a little too high on the one side cause suddenly I just hit the ground so hard, I hit my head on the sidewall of the tunnel and I just saw a spark of metal hitting the cement and heard the noise. It was so dark that I did not see anything and did not know if my bike was in one piece or not. We ran out of the tunnel to let the other people pass and checking that the bike all looked fine. I got back on the bike but my left arm started to swell up in 2 places and I almost fainted just looking at it. It looked like there were bone broken underneath the skin and I just cried since I just could not take any more setbacks right now. Luckily there was a water point with doctors only 1 km from the tunnel. We stopped there and the first comment from the doctor was that I was stopping and going for x-rays. But I did not think it was broken (I have broken so many bones in my life to recognize the feeling) and with only 27 km left of this terrible week I did not want it to end there. They bandaged my arm so that I did not need to see it and we carried on. I had broken my glasses and my shoe, and my jersey and sock, so I felt pretty broken by now. That to be added to my already strapped right arm and hip. The last 27 kilometres were long and there were a lot of not so positive thoughts running through my head, what a week it had been!! 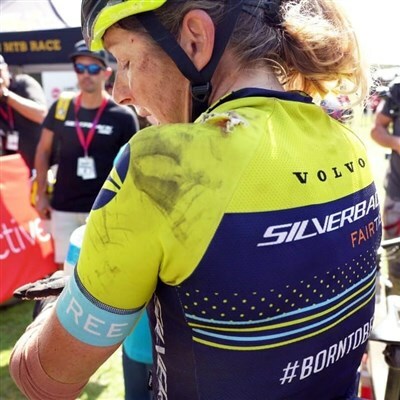 I was so relieved to finally reach the finish at Val de Vie that I cried on the finishing stretch, I also had flashbacks from the exact same finishing stretch 2 years ago when I also had tears in my eyes riding there, but then it was tears of joy since we won my biggest victory in my cycling career. Two completely different situations…. The doctors were already waiting for me behind the finish line and the ambulance was on its way to take me to the hospital in Paarl for X-rays. 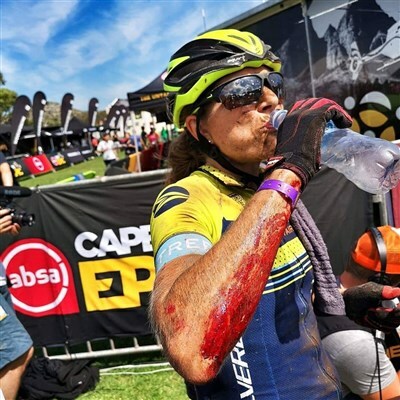 The organization on Cape Epic is really amazing when it comes to the medics, the doctor at the water point had called the doctors at the finish to inform them that I needed x-rays and everything went really smooth! What feels a bit sad afterwards is that Mariske and I did not even get a picture of us after finishing this week together, to have that classic finishers picture, and I didn't get to go through the normal way to collect my well earned finishers t-shirt, medal and bag. Also, not meet all the friends who were there to watch. Instead I got to go in the ambulance for x-rays. Craig came to the hospital to pick me up and was with me when the doctor came with the good news that nothing was broken. I seriously do not think I could have handled bad news at that stage. Not after a week which I already wanted to forget about. 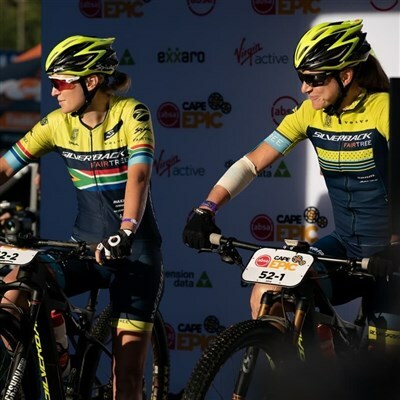 There had been some other small things in the background which also added on to things going wrong, so this Cape Epic is now in the past and I am looking forward instead! I would like to thank Fairtree for the incredible support I had from you during the week, all the messages and motivational words, you guys are amazing and I am so proud to have you as my sponsor!! A huge thank you to Nicole who has been our rock during this week, we could not have done this without you! 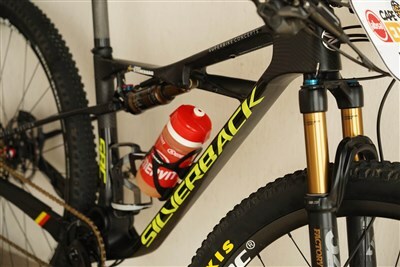 Thanks to Silverback who has been on site with mechanics, manager and media team. As I write this I have had a week off to rest and recovery, my arm is still swollen and hurts but at least I am over my cold and can start to ride again. It is time to look forward to the season ahead and in a months time I will change continent and fly back to Sweden where I will ride for ÅBRO again. 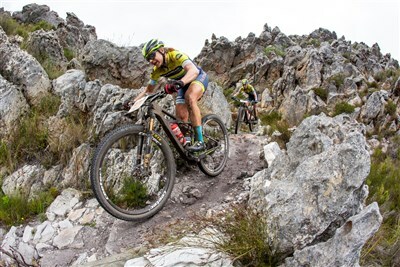 But for now I have a month in Stellenbosch to enjoy the trails which we did at the Epic, I will enjoy them more now than what I did last week. Nicole and Geordie who helped us so much during the week, thanks guys! My new Stratos which was rock solid during the whole Epic! Stämmer in väl tycker jag.